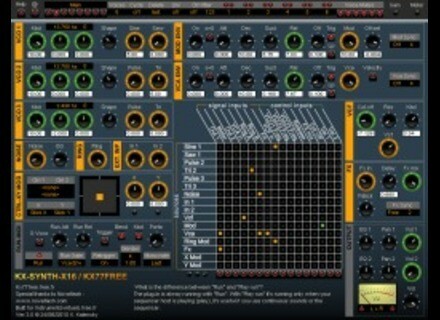 KX-Synth-X16 v3 [Freeware], Virtual subtractive synth from KX77FREE. 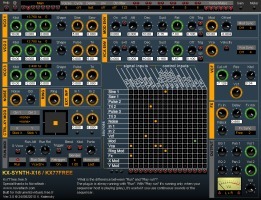 KX77FREE has released version 2.0 of KX-Synth-X16, the virtual analog modular synthesizer plug-in based on the VCS3 structure (but with additional features). One of the new features of version 2.0 is the polyphony (6 voices), with a total respect of the feeling of the original synthesizer, the company promises. A new "KXMOD system" is implemented to create fat vintage leads or nice polyphonic instruments, they say. Also, a CV and gate sequencer has been added to create real vintage sequences. knobster Releases MelloFan With this new synthesizer from knobster you can perform music "on an ordinary household fan", according to the company. Lick Library Presents: Learn To Play Guns N' Roses DVDs First up is the two part Learn to play Guns N’ Roses DVD sets, with eight hours of tuition. MusE - Linux Music Editor v1.0 RC3 Release Candidate 3 of MusE - Linux Music Editor v1.0 is now available for download from SourceForge.